Powers/Abilities: In human form, the Bogeyman possessed no known superhuman abilities. He was a capable businessman with a moderate understanding of advanced technologies. He wielded handguns and had access to surplus Project: PEGASUS battlesuits and the more advanced weapons armors used by the anti-mutant Right organization. The battlesuits allowed him to fly. In battle, he carried both a tranquilizer dart gun and "power-canceling envelopes" used to carry and incapacitate superhuman captives. He used a number of robotic cartoon animals to guard his base. As a demon, he was superhumanly strong and his natural tendency towards gluttony was extremely exaggerated. He could flow like liquid through small spaces, growing and distending his form at will. Bogeyman could form lethal claws and "sniff out" his targets. In his shadow form Bogeyman did not possess a body, his sole connection to the physical plane was a golden ring that housed his essence. He could possess whoever put the ring on, controlling their actions and feeding off their emotions. He could alter the size of the ring to accommodate potential hosts and generate shadowy tendrils. In his shadow form, he was exceptionally scared of and vulnerable to heat and flame. (Power Pack I#43 (fb) - BTS) - As a child, Douglas M. Carmody was taught by his parents that he had to prove himself worthy of their love. He had to constantly earn their affection by living up to their standards. If he even slightly let them down, he was told he was a useless, fat little pig. This resulted in him developing a warped self image and a dislike of other "happy" families. (Power Pack I#2 (fb) - BTS) - Carmody grew up to become a wealthy businessman who had hired Dr. James Power to work on an anti-matter energy converter for him. Carmody believed in the project and put in millions of his own money. While Power wanted to use the invention for the betterment of mankind, Carmody figured he could sell the revolutionary device as a weapon. Though he kept this motive hidden until Power had completed the work. This didn't prevent Power from telling his young children that his boss wasn't a nice man. (Power Pack I#2) - When their parents were kidnapped by the alien Snarks, the newly empowered Power kids figured they needed to get their dad's invention to help get their parents back. They sneaked into Carmody's facility, overhearing him on talking on the phone to a business associate about how he was going to weaponize the converter. Convinced they were doing the right thing, the peckish youngsters also spotted a ham sandwich in Carmody's office that Mass Master decided to retrieve. Still not in control of his powers, he caused quite a ruckus but escaped unseen, leading Carmody to believe there were poltergeists in his office. A little while later, he witnessed the Power children actually stealing the converter. Overhearing their names, he realized who they were and incorrectly figured the young kids were mutants. He told his underlings to contact government official Henry Peter Gyrich. (Power Pack I#5) - Carmody met with Gyrich and made his case, asking Gyrich if he could borrow the recently invented mutant detector as well as some operatives to help track down and apprehend the mutants. Gyrich agreed and assigned agents Link and Falcone to the case. A little while later, after the Powers had returned from space following their fight against the Snarks, he tracked the Powers family down to a local McBurgers restaurant. He moved in with Falcone and Link, who had already taken a dislike to the gruff and abrasive Carmody. The Power children spotted Carmody coming and quickly excused themselves to go out and change into their costumes. They led Link and Carmody away from the restaurant while Falcone went in to chat with the Powers. His bulk prevented Carmody from following the children through a crack in a wooden fence, but he ordered Link to pursue them with the mutant detector. Link chased them to Lookout Point, overlooking a cliff side. Power Pack used their powers to move over the edge, to have a private conversation out on the ledge. Link first thought they had vanished, until he heard voices. He went to check and accidentally fell over the cliff. The Power Pack combined their abilities to save him, but that just made them an easy target for Carmody who opened fire on them. The Pack deflected his shots and the gun fire alerted Falcone and the Powers to their location. A furious James Power knocked out Carmody for having threatened the life of his children. He quit his job on the spot, while agent Link quite correctly pointed out that the mutant detector did not register any of the Power children as X-gene positive. (Power Pack I#14 (fb) - BTS) - The loss of the anti-matter converter cost Carmody his business when his investors backed out. Bankrupt, furious and blaming Power Pack, he decided to have his revenge. Calling in a favor from an old contact at Project: PEGASUS he acquired a surplus battle armor and various non lethal stun and containment weaponry. Donning the equipment, he set out to make Power Pack pay for his misfortunes. Carmody began to study the kids' movements across New York City, using the armor's flight capabilities to stay hidden while he learned their patterns and where they went to school. (Power Pack I#14) - After he learned all he needed to know, Bogeyman decided to take on Katie Power first. He infiltrated her preschool and abducted the youngest of the Power siblings with relative ease. Before he stunned her with a see-through power-cancelling envelope, Katie got off a giant powerball that shot up in the air. Alex Power spotted the energy globe during class and then saw Carmody fly by with Katie. Alex quickly gathered his siblings and together they rushed to catch up with the Bogeyman over the Hudson River. Thanks to a sneak attack by Mass Master, Carmody was forced to drop Katie. Furious, Bogeyman explained he had lost his job when the kids took the converter and now he was planning to kidnap them and sell them to the highest bidder. However, once Katie was free, she was able to disable the villain's flight pack. Carmody fell into the water, swearing his return would only be a matter of time. He vowed to get them all because he knew where they lived. (Power Pack I#15) - Still out to get Power Pack, the Bogeyman wandered New York City until he spotted Lightspeed (Julie Power) flying over Central Park where a recent Asgardian delegation was getting ready to return home. Julie decided to check in on them, followed by Bogeyman who readied his tranquilizer dart gun just as Volstagg was passing by. Carmody missed his shot, accidentally hitting the Asgardian instead. Due to a mixup, Volstagg thought Julie had attacked him which led to the other Power kids coming to her rescue. They explained the situation and the fact they were hounded by the Bogeyman while returning Volstagg to Hogun and Fandral who were waiting for their companion. While they were talking, they spotted the Bogeyman flying by. 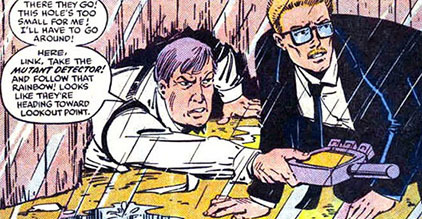 Though the Warriors Three offered to help, Power Pack insisted they took care of the villain themselves. Though they tried their best and even got him to briefly surrender, the naive children never stopped to consider Carmody might be lying. When he resumed his attack, Hogun the Grim had enough and disabled Carmody's rocketpack by throwing a sword through it. Crashing to the ground, Carmody was faced by the Warriors Three who in no uncertain terms convinced him to leave Power Pack alone lest he felt the wrath of Thor himself. (Power Pack I#40 (fb) - BTS) - Still not ready to give up on having his revenge against Power Pack, Bogeyman decided to dedicate himself to kidnapping mutant and other superpowered children. He set up a headquarters in New York City, outfitted with several miniaturized toys and robotic cartoon characters who were to act as guards and protectors. (Power Pack I#40 - BTS) - One of Bogeyman's clients was the limbo demon N'astirh, who was looking to acquire 13 infants with mutagenetic potential to complete a pentagram that would link his realm to Earth for an impending invasion. Unaware of this and seemingly undisturbed by the fact he was dealing with a demon, Bogeyman agreed to go out and collect young mutants for cash. (Power Pack I#39 - BTS) - One of Bogeyman's first victims was the mutant teleporter Lighttrakker (Rebecca Littlehale). He captured her in his power-cancelling plastics and brought her to his headquarters. (Power Pack I#40 - BTS) - Rebecca's abduction made headlines, getting both Power Pack and the New Mutants involved in the case. Combining forces, the two teams compared notes and realized Bogeyman was behind the kidnapping. 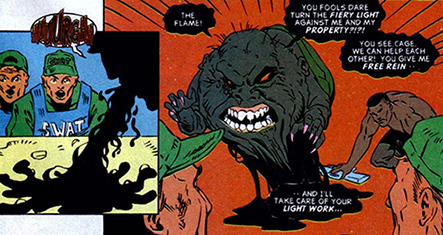 To draw the villain out into the open, the New Mutant Warlock shapeshifted himself to resemble Bogeyman while Katie Power dressed like Rebecca. Taking photographs of the staged kidnapping, Magik covertly teleported the pictorial "evidence" to various news outlets to spread the identity of the Bogeyman. (Power Pack I#40) - Frustrated by this, Bogeyman went on the offensive and kidnapped Katie Power. Both teams gave chase and tracked Carmody down to his base just as he was trying to offer his captives to N'astirh. The demon refused Katie and Rebecca because they were too old and stayed to watch how Bogeyman tried to fight the newly arrived heroes. Making short work of his toys and robotic cartoon guards, the New Mutants closed in on Carmody. Magik grew furious with him after Dani Moonstar materialized his fondest desire: getting rich off the deaths of innocent mutant children. Disgusted by the Bogeyman's intent and actions, Magik opened a portal to limbo, condemning Carmody to the demons there. (Power Pack I#42) - Stuck in limbo, Carmody was besieged by several minor demons until N'astirh showed up to take an interest in his case. Remembering their original deal, the sadistic head demon remarked that Carmody was now unable to fulfill his end of the bargain, forcing them to "alter" their arrangement. N'astirh turned Carmody into a demon, by eating away all that was human about him, commenting that the obese man tasted greasy. N'astirh turned Carmody into one of their own and sent him back to New York, already in the midst of a demonic invasion. The sweltering heat and penetrating aura of evil had sent crime spiraling out of control, with gangs of looters raiding people stuck in gridlock traffic in and out of the city. Bogeyman arrived in the midst of the chaos and was disgusted by what humans were doing to each other. He immediately attacked those who offended him and even wound up killing an obese bystander who was actually cheering him on. Condemning the man for letting himself go, Bogeyman nevertheless took his clothes before moving on to find the Power Pack children. Using his demonic senses, he tracked the Powers down to their apartment where both the parents and the children were suffering from the extreme heat. Julie Power was even starting to hallucinate from heat stroke and exhaustion, causing the others to dismiss her warnings of the Bogeyman lurking in the shadows as fever dreams. The Bogeyman waited around until the Powers decided to take Julie to a hospital. When they were all in the elevator, the Bogeyman attacked. Ripping the cart apart and grabbing James and Margaret Power, he forced their children to reveal their true identities. Annoyed and defiant, the four Powers children complied and shifted into their costumes. (Power Pack I#43) - Pleased he had forced Power Pack out into the open, Bogeyman took off with their parents. The young heroes pursued, ready to kill the villain and wondering what could have happened that changed him into an actual bogeyman. Carmody led them on a wild goose chase across Manhattan, ultimately leading to the Empire State Building. However, on the way there the Power Pack felt obligated to stop and aid New Yorkers who were being attacked by random limbo demons. Fed up with waiting around for his young quarries, the Bogeyman threatened to throw James and Margaret Power off the Empire State Building. Sadistic as he was, Bogeyman ended up tossing them over the edge even after Power Pack complied. Katie and Julie dove after their folks while Jack and Alex prepared to fight Bogeyman to the death. All the while, he kept needling them with falsehoods about their parents, their sense of worth and whether or not they'd been good persons. When James and Margaret rejoined their children, Bogeyman revealed why he hated the Power family so much: it was because of their foolish, hippie inspired unconditional love they had for their children. Getting so worked up he was ready to kill everyone in sight, Bogeyman was forced to face facts by James Power who made his old boss look at his own reflection in a nearby window. Power pointed out to Carmody he had now become the monster he loathed in others, with a face only a mother could love. This triggered a wave of rage and emotions in Bogeyman who jumped off the Empire State Building and vanished into a newly opened firepit on the sidewalk. (Cage I#19 (fb) ) - The fires of Inferno consumed the remains of Carmody's human form. Reborn as a living shadow, he felt cleansed and purified, no longer burdened by the emotional baggage of his former life. However, a new and greater hunger started to grow inside him, as well as the need to find shelter. He housed his essence inside a plain gold ring that allowed him to possesses whoever wore it. After cycling through several unrevealed hosts, he found permanent residence in city councilman Randolph Creed whose unreasonable anger towards the homeless sated Bogeyman's hunger for intense human emotions. Both Creed and Bogeyman were satisfied with their new status quo, until Bogeyman saw Luke Cage fight. Intrigued by the idea of possessing a superhuman, he traded in Creed for Cage who remained in the dark about all this until he slipped the ring on his finger. (Cage I#19) - Bogeyman managed to take over Luke's mind, leaving Cage unaware of all the violence and terror he committed in his form. When Cage woke up the next morning in his apartment, thinking he had only dreamed the carnage he'd caused, he found his tenement building surrounded by local police officers. Bogeyman then revealed himself, explaining his origins and mocking Cage who was desperate to be free of him. Cage thought to rid himself of Bogeyman by trying to remove the ring, but found it had become as impenetrable as his own flesh. While they continued to argue, the NYPD stormed Cage's place. They fired a flamethrower at him, which scared the Bogeyman (flames reminded him of his fiery death during Inferno). He had Cage throw up his dark essence. The Bogeyman's horrible, intangible form scared off the police officers leaving Cage to fight his tormentor. Their battle eventually brought them downstairs. (Cage I#19 - BTS) - Cage's ally, private investigator Dakota North, learned of Cage's rampage and went to his home to check on him. Slipping past the police, she made her way inside the evacuated building. (Cage I#19) - Cage, still struggling against the Bogeyman's influence, was in the basement when he ran into Dakota North who was more than a little stunned to find what her ally was dealing with. Realizing this was way out of their league, Cage and North figured they needed the aid of Reed Richards of the Fantastic Four. To elude the police, Cage caused the abandoned building to collapse on itself, escaping with Dakota through a secret tunnel that led them outside and away from the police cordon. Dakota drove Luke in her car to Four Freedoms Plaza, but Cage was shocked when mid-way there he spotted the Bogeyman's reflection in the rear view mirror, gloating at him. Right before they arrived, Bogeyman reasserted control over Cage, forcing Dakota to crash her car straight into Four Freedoms Plaza's lobby. The racket got the Thing's attention who arrived in time to see Cage had been completely taken over by Bogeyman. (Cage I#20) - The Bogeyman-controlled Cage fought the Thing across Manhattan, with Luke engaging the demon in his own mind. Luke was learning the Bogeyman's secrets and hidden weaknesses, but had no way of expressing them. Fighting Luke slightly distracted Bogeyman, causing him to behave somewhat erratic, but he nevertheless managed to knock out the Thing. Watching the unconscious FF member, he decided Ben Grimm would make a more suitable host than Cage. While he was making preparations to have the golden ring fit on the Thing's oversized digits, the Human Torch and Dakota North arrived to help. Fearing flame, the Bogeyman ran off, desperately trying to avoid the FF's junior member. In the end, Johnny grabbed "Cage" and yanked him up in the air with him. This scared Bogeyman to such a degree, he released control long enough for Luke to tell Johnny fire was the enemy's weakness. Flying towards the docks, the Human Torch dropped Cage and went semi-nova, generating incredible heat and flame long enough for Cage to jump into the blaze. This scared Bogeyman right out of his body, and though the villain tried to return to his ring he found he was unable to because the intense heat had already started to melt the trinket. With no apparent place left to go, Bogeyman seemingly ceased to exist. That Bogeyman sure got around. 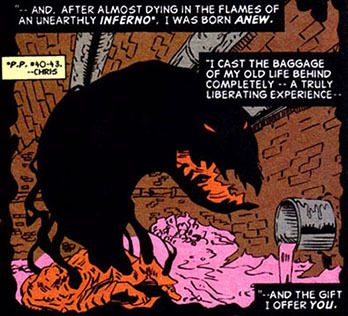 Starting out as a fat, corrupt businessman with mommy issues he became a fat kidnapper of mutant children before turning into a gluttonous limbo demon and as an encore, he wound up a corrupting shadowthing living inside a golden ring... All within nine appearances! 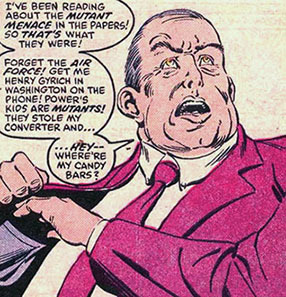 A case could be made that all of Randolph Creeds' appearances before the reveal he was host to Bogeyman warrants a BTS credit for the character. On the other hand, since we can't tell when Creed's actions were his own or when the Bogeyman was behind the proverbial wheel let's suffice with the basic flashback explanation of the Creed/Bogeyman relationship in Cage I#19: the demon simply fed of Creed's natural rage issues. 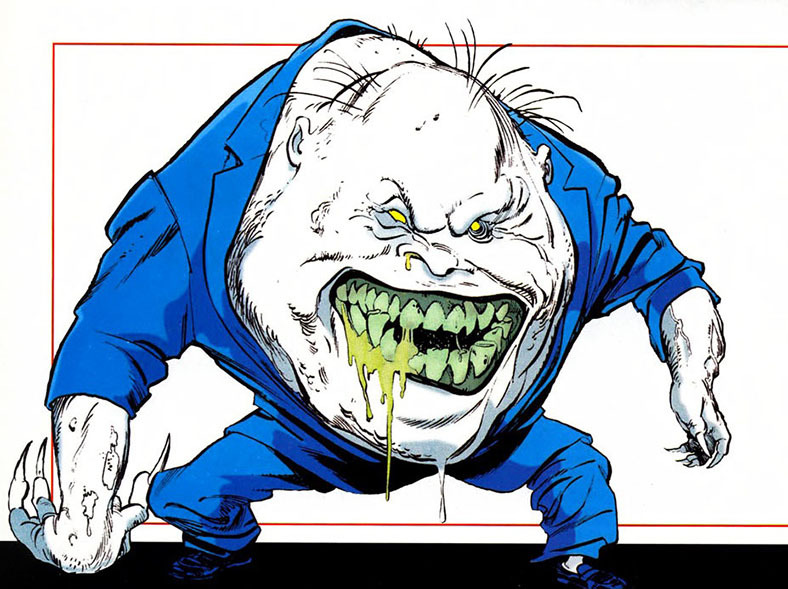 Bogeyman received profiles in All-New Official Handbook of the Marvel Universe#2 (2006) and Official Handbook of the Marvel Universe A-Z HC#2 (2008).